Hourly GridRad analyses for the years 2015 and 2016 are now available from the NCAR Research Data Archive. Thanks to the RDA for their continuing support. We hope to produce improved versions of the GridRad analysis and extend the analysis period forward and backward in time. Our best argument for continuing the GridRad analysis is to demonstrate its usefulness for research and teaching. So, if you use the GridRad data in your research or for other purposes, please drop us a line and let us know how you are using it. Publications that use GridRad data should cite it as requested on the NCAR RDA web page. Hourly GridRad analyses are now available for the years 2013 and 2014 from the NCAR Research Data Archive. Thanks again to the RDA for hosting the archive! 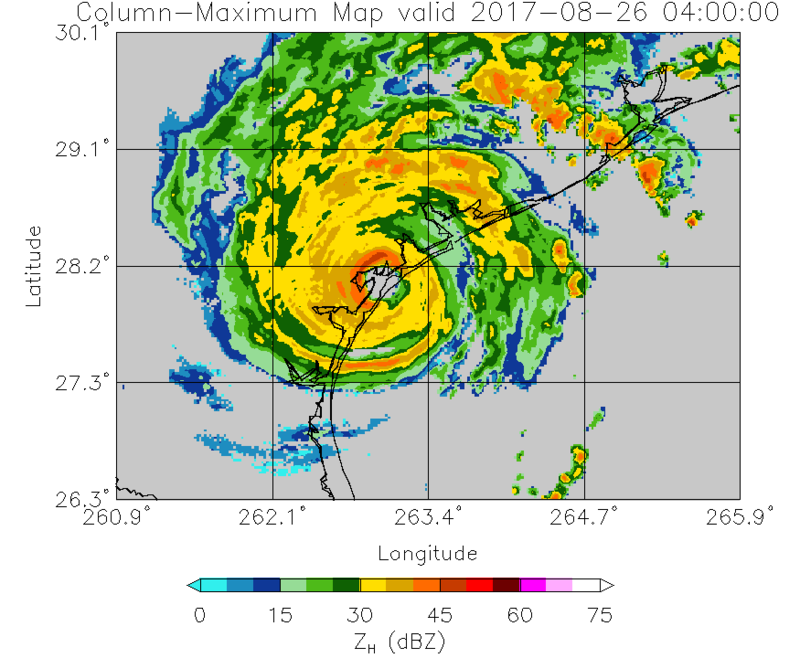 We are pleased to annouce public availability of preliminary dual-polarization GridRad version 4.0 analyses for Hurricane Harvey. The analysis period extends from 25 August 2017 at 00:00 UTC to 31 August 2017 at 00:00 UTC and covers a relatively small region encompassing most of Arkansas, Louisiana, Mississippi, Oklahoma, and Texas. The data may be viewed by using the latest release of GridRadViewer (version 1.02). Links to download daily TAR files and animated GIFs of column-maximum *Reflectivity* from GridRadViewer are provided below. 2018-02-02 UPDATE: These data are no longer available since they are not compatible with the latest version of GridRad_Viewer. Unique data products for GridRad users. Opportunities for users to provide feedback to the developers about GridRad data products. Opportunities for us to test the GridRad algorithm and/or quality control practices before public release of a new national hourly or sub-hourly archive. Once the new algorithm has been thoroughly tested, and assuming continued funding, we plan to reprocess the entire archive from at least 2004 onward using the new algorithm. The comprehensive GridRad products will be placed in the NCAR Research Data Archive when they become available. Domain changes - The domain will expand to cover the entirety of the Contiguous U.S.
Horizontal grid changes - The horizontal grid resolution and alignment will be changed slightly to allow for more flexible regridding. It will continue to be a regular longitude-latitude grid. Vertical grid changes - The vertical resolution will increase from 1 km to 0.5 km for altitudes up to 7 km above sea level. This change is aimed at improving the representation of stratiform rain regions in GridRad data. 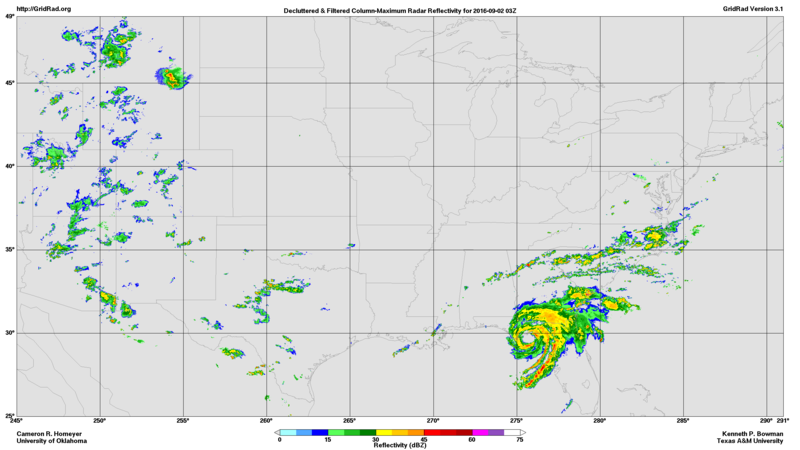 New variables - From 2013 onward, the analyses will include at least three new dual-polarization variables: the Differential Radar Reflectivity, the Specific Differential Phase, and the Co-Polar Correlation Coefficient. The new variables will provide additional physical information about the observed hydrometeors. We are in the process of extending the hourly GridRad analyses to include the period 2013 through 2016 using the Version 3.1 algorithm. The analyses for 2013 and 2014 are complete and have been sent to NCAR. We will post an update when they are available in the NCAR Research Data Archive. Analyses for 2015 and 2016 should be available within a few months.